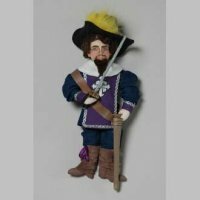 One of the three musketeers in the Dumas pere novel of the same name. He is older than the others and has mystery in his past. He is somehow connected to Milady DeWinter. By the end of the novel, he is revealed to be the Compte de la Fere, Milady’s husband before she “married” Baron DeWinter, and thereby adding bigamy to her list of crimes.